New transport ideas in London and the UK. One possible route southwards for the Bakerloo Line. This plugs a gap in services around Old Kent Road, Walworth and Peckham, some of the most deprived and worst-connected inner-city neighbourhoods in London. The idea has been mooted for some time, but the political will does not yet exist to take on the relatively modest scheme, whilst massive schemes such as Crossrail have been prioritised. 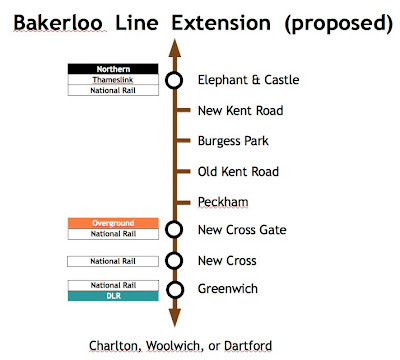 Bakerloo services to New Cross means London Overgound services need no longer stop there and the clumsy spur can be ripped up. The station will allow interchange onto the tube for mainline commuters from Kent. There exists the potential to takeover National Rail tracks beyond Greenwich, which are at surface or in cutting, on to Catford, Woolwich, or even as far as Dartford.